Shake with ice, strain into a Collins glass with ice, top with soda (2 oz), and garnish with an orange twist. Two Wednesdays ago, I was excited to utilize my new purchase of Nico Martini's Texas Cocktails for the evening's libation. There, I spotted a bitter whiskey number called the Old Timer from Peggy's on the Green in Boerne, Texas, that seemed like a good place to start. Once prepared, the Old Timer offered up orange oil and Bourbon notes to the nose. 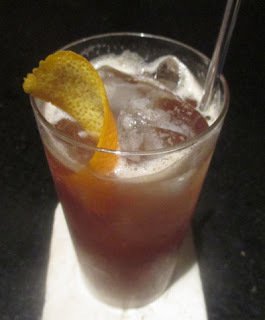 Next, a carbonated caramel, grape, and lemon sip slid into Bourbon and a rounded bitter flavor on the swallow with a funky herbal finish from the Cynar.